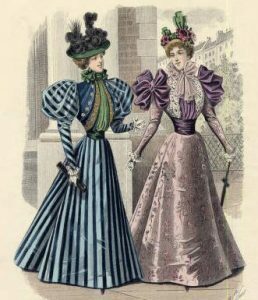 It was the 1890s. Catherine Foristal, the daughter of two Irish immigrants in St. Louis, Missouri (and my great-great-grandmother), had just gotten her first job at a shoe company. 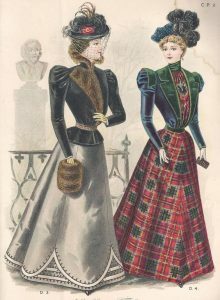 Each day, on her way to work, young Catherine would pass by a millinery (hat) store, peering in the window and seeing what new styles and items had arrived. One day, however, she stopped in her tracks – in the shop was the most beautiful hat she had ever seen. Black, modern, and adorned with an arched, elegant ostrich feather, the hat would look absolutely stunning on her. But one look at the price tag sent her quickly on her way. In the following days, every single morning and every single evening, Catherine would walk by that hat, longingly envisioning it on her own head. But she knew her mother would never allow it. 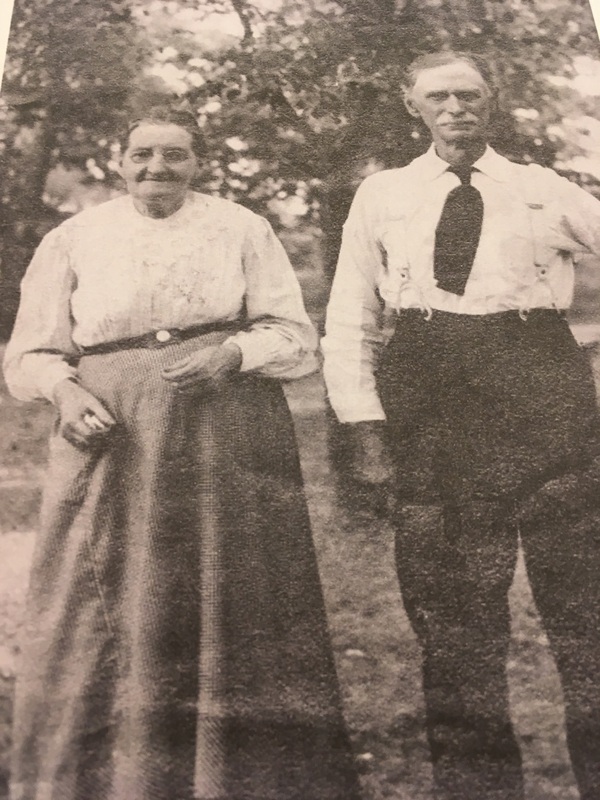 Jane Foristal, who, like her husband, had emigrated to America in the wake of the Irish potato famine, was a frugal woman. In addition to having six mouths to feed, spending money on such frivolities as a fancy hat was something she would never do. Or allow her children to do. Pay day at the shoe company finally arrived. After picking up her money, Catherine began to make her way home. As she walked past the millinery shop, she thought to herself, “I have the money…and it really would look lovely on me….” She just couldn’t resist. 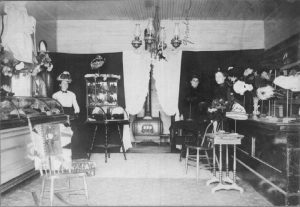 With her wages weighing down her pocket, Catherine walked into the shop and bought herself the beautiful black hat with the long ostrich feather. When the cashier handed her her purchase, she couldn’t believe it – the stylish hat now belonged to her, Catherine Foristal! But what about her parents? Well, she would just have to hide the hat. With a new resolve, Catherine marched the rest of the way home, planning and scheming. Once there, she quietly opened the front door and smuggled the hat up to her bedroom, planning to try it on for the first time after dinner. Dinner that night was hard to sit through, but it eventually drew to a close. As soon as she could get away without arousing suspicion, Catherine slipped upstairs, anticipating the moment when she would finally see her beloved hat on her head. She quietly took the hat out of it’s hiding place, reverently running her hands up and down the beautiful ostrich feather. All of the sudden, she froze – her mother’s footsteps were on the stairs. “Catherine?” her mother called out. Panicked, Catherine didn’t know what to do. There was no time to hide the hat. As a cool breeze hit her face, Catherine saw her chance – she impulsively tossed the hat out her open bedroom window, sailing it down to the yard below. Her bedroom door opened a second later. 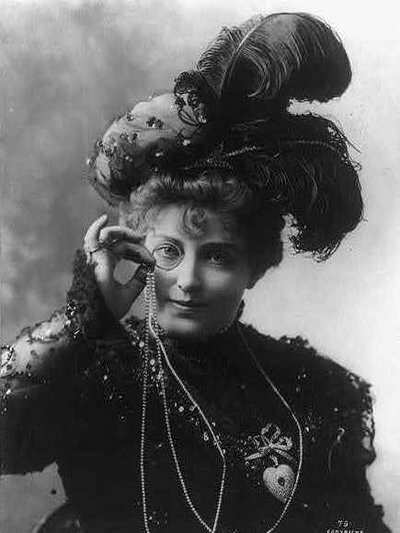 American actress Lillian Russell, in the hat style of the times, 1898. Later that night, Catherine snuck out into the yard, hoping against hope that the nagging suspicion whirling around in her mind was wrong. As she bent down in the bushes, she reached for her new hat, only to find it sopping wet and completely ruined. She never told her parents there was no cat. Poor Catherine! How sad that she lost both the hat and the money she spent on it. But what a fun/funny story, too. The rest of her descendants will probably enjoy this anecdote, too. Yes, definitely a sad but funny story. My relatives are reading it today as well, I hope they enjoy it. Thanks for your comments, Nancy! Hope you’re well!